Happy Monday! Last week I previewed our Spring Sale and Red Tag Event, so this week I thought I'd post some pictures of some of those special Red Tag items, so you can get a feel for the look and price points of some of our amazing deals! 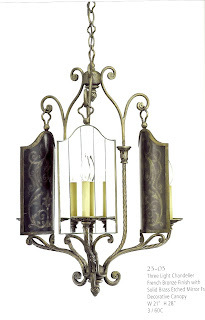 This chandelier was originally priced at $721.80, but our special red tag price is $299! This is from their Marquis collection, and has a French Bronze finish with a Solid Brass Etched Mirror Frame. It's 21" wide by 28" high and takes three 60-watt candelabra lamps. Please let me know if you'd like any other info on it, and stay tuned ~ my intention is to feature a different Red Tag special every day.